Welcome to The Grand Isle Resort four-bedroom penthouse, a stunning resort in the Exumas in the Bahamas. It is a very nice beachfront resort that has wonderful beach access. The villas are more ocean view rather than beach front, but the beach is mere steps away. There is a wonderful restaurant on-site, communal pool, lots of water sports and many activities to do. You can go swimming with the pigs on a day trip which was great fun and the water here is super calm and the beach is simply pristine. There is also lots of restaurants and amenities nearby as well as a golf course and grocery store too. Located on the Great Exuma and its Cays which are the most exotic of the Bahamas Out Islands, like a collection of precious gems, the islands are set in a sea of Technicolor blues bordered by ivory beaches. Gentle winds help maintain a balmy and warm tropical climate year round, making Exuma an ideal vacation spot for any season. Summer temperatures range between 80-90 degrees, and winters in Exuma are mild with temperatures rarely dropping below 78 degrees. Great Exuma has always been the best kept secret of savvy tropical vacationers. Ideally located on Emerald Bay, Grand Isle Resort & Spa is your gateway to exploring this island paradise. From the architecture and interior design to a host of modern conveniences and thoughtful touches, all of the one to four bedroom villas at Grand Isle Resort & Spa offer luxury, quality and extraordinary value in Great Exuma.The resort's spacious oceanfront and resort view villas feature luxury amenities including custom furnishings, private balconies or patios with sweeping views of turquoise waters, a pristine golf course and gardens that make Great Exuma a nature-lover's tropical paradise. Individually decorated, the villa interiors are well-appointed with gourmet kitchens and wireless Internet. The jewel of Great Exuma - our 4-bedroom, 4.5-bath Grand Penthouse - is just over 5,200 square feet and features spectacular ocean views from the highest point in the resort. It offers a spacious living room, banquet-style fully appointed gourmet kitchen with granite countertops, and grand dining room with seating for up to 12 guests. You'll also enjoy an expansive 1,100-square-foot oceanfront balcony overlooking our famous Exuma waters and the Greg Norman-designed championship golf course. This exceptional Penthouse villa also features natural stone louring throughout, a separate Media Room, surround-sound speaker system and a private elevator opening into the living room. Great Exuma has always been the best kept secret of savvy tropical vacationers. 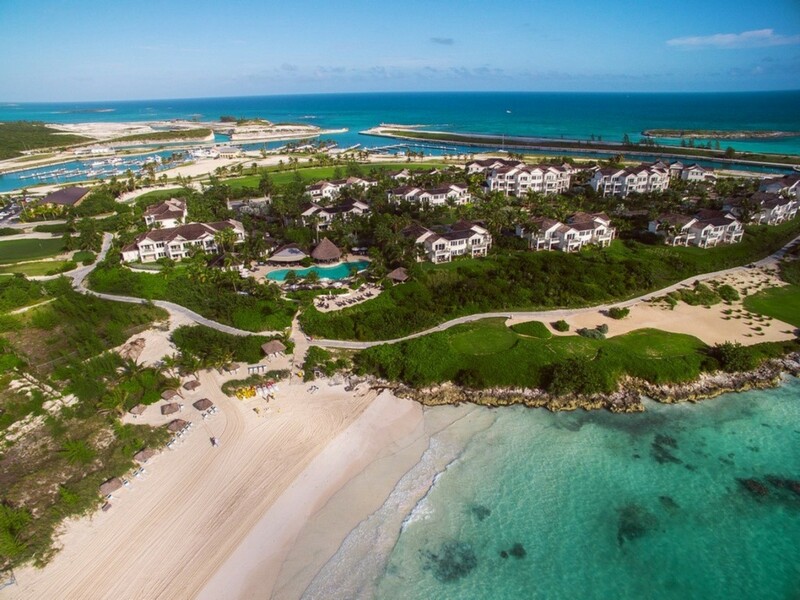 Ideally located on Emerald Bay, Grand Isle Resort & Spa is your gateway to exploring this island paradise.Getting to Great Exuma is now easier than ever. Direct flights to Exuma International Airport (GGT) are available from several U.S. cities, as well as Canada. The following airlines offer direct service from these hub city gateways: Delta Airlines from Atlanta; American Airlines from Charlotte every Saturday; Silver Airways from Ft. Lauderdale; American Eagle from Miami; and Air Canada from Toronto. Once you arrive on the island, Grand Isle Resort & Spa is located about 15 minutes from Exuma International Airport (GGT) by car.